As a signifier of status, this bed is intricately decorated with auspicious motifs and embellishments. Decorative fabric would have been draped between the posts of the bed and on top of the wooden canopy. The ceiling is decorated with a wooden cupula. The Bed measures 4 inches high to top of finial x 3 1/2 inches long x 2 1/4 inches wide. 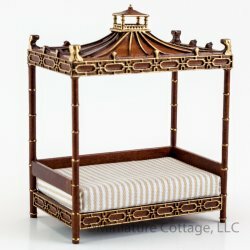 There are 2 bolsters and the bed is available in a mahogany and gold finish.